In 1744, the courthouse for the new County of Albemarle was established at a site that would latter became known as Scott's Landing. This site was to west of the present day Town of Scottsville. The house of Edward Scott was used as a temporary courthouse until one could be built. This site was used as the county seat until 1762 when a new courthouse was erected in the new Town of Charlottesville. Gradually all evidence of this early community faded from site and history. . 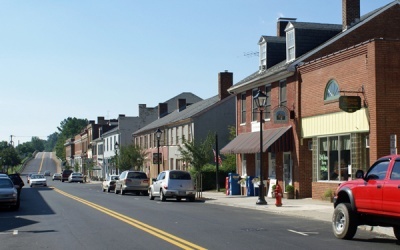 The General Assembly established Scottsville as a town in 1818 and it was officially incorporated in 1833 at the northern-most point of the river. 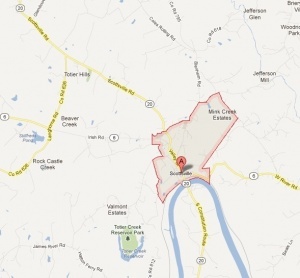 Scottsville was founded as a river town with a tobacco inspection station and a ferry. It served as a port on the James River for the batteaux that traveled up and down the river. The original town was formed around 15 acres owned by Dr. John Scott. The town expanded rapidly, especially after the Kanawha Canal on the James River was completed to Scottsville in 1840. Growth was curtailed near the end of the Civil War when in 1865 US General Phil Sheridan, along with General Custer, came through the town. Five weeks latter these troops were at Appomattox. A massive flood in 1870 set the town's economy back, as well as further flooding in 1877 and 1888. In 1944, the United States Rubber Factory established operations in Scottsville, reviving the economy. However, many people commuted to their work, and did not move to the town. Population declined to as few people as 239 in 2000. A massive flood control project was completed in 1989, enabling the town to escape the constant threat of flooding. This factory closed in early 2009 and now sits empty. On January 1, 1994, Scottsville annexed 856 acres of Albemarle County, growing the population by several hundred. Scottsville was established in 1818 and incorporated in 1833. The town operates under a mayor-council form of government with its own Town Administrator and Clerk. The six-member Town Council and the mayor are elected from at-large districts for a term of two years. Elections occur on the first Tuesday of May in even-numbered years. Other town boards include the Planning Commission, the Scottsville Architectural Review Board, and the Board of Zoning Appeals. The Planning Commission develops a Comprehensive Plan every five years to guide development, updates the town’s Zoning Ordinance, and hears zoning issues. The Architectural Review Board’s role is to protect the character of the historic district by reviewing plans for new construction and alterations to structures within the historic district and entrance corridors. The Board of Zoning Appeals hears requests for variances to the zoning ordinance and appeals of determinations by the zoning administrator. Each of these boards is filled by volunteers receiving no compensation for their time and effort, other than the satisfaction of knowing they have given their best to serve the community. FY2009 budget for the Town of Scottsville is $426,080. Scottsville has not had a real estate property tax rate separate from that levied by the County of Albemarle since 1992. “We’re pretty dependent on our meals tax because we’re one of the only towns that doesn’t have its own property tax levy,” Town Administrator Clark Draper said. In a copy of the proposed budget, the meals tax accounts for the largest portion of the town’s revenue, a little more than 22 percent. Scottsville hasn’t had real-estate taxes since 1992, when it expanded and annexed part of Albemarle County. The deal with the county was that if Scottsville annexed county land, the town couldn’t have real-estate taxes for five years, Draper said. Since then, the town has been able to maintain its budget without real-estate taxes, he said. In 2010, Scottsville Planning Commission heard a request from a developer to re-zone 50 acres of rural land under the town's jurisdiction to make way for a new residential neighborhood. The commission unanimously recommended approval. The town currently encompasses 979 acres. The town completed the second phase of a streetscape improvement project in 2012. The $700,000 beautification project was intended to add streetlights and handicap accessible ramps. ↑ Web. American FactFinder, United States Census Bureau, retrieved January 24, 2019. ↑ 2.0 2.1 2.2 2.3 2.4 2.5 2.6 Web. Town of Scottsville Comprehensive Plan, Town of Scottsville, June 18, 2008, retrieved December 28, 2010. ↑ Web. "About the Museum. ", Scottsville Museum, retrieved 28 June 2010. ↑ Web. City's Communication With World Interupted; Scottsville Under Water, Staff Reports, Daily Progress Digitized Microfilm, Lindsay family, January 24, 1935, retrieved January 22, 2017 from University of Virginia Library. Print. January 24, 1935 page 1. ↑ Web. Scottsville Council Votes to Rent Lot, Staff Reports, Daily Progress Digitized Microfilm, Lindsay family, March 15, 1948, retrieved December 12, 2016 from University of Virginia Library. Print. March 15, 1948 page 8. ↑ 6.0 6.1 Web. Town Council and Staff, Town of Charlottesville, retrieved January 24, 2019. ↑ 7.0 7.1 Web. "Scottsville council to consider new taxes. ", Bacaj, Jason, Daily Progress, World Media Enterprises, 23 June 2009, retrieved January 24, 2019. ↑ Web. Scottsville development proposal draws little response, Brandon Shulleeta, Daily Progress, World Media Enterprises, December 20, 2010, retrieved January 24, 2019. ↑ Web. After delays, Scottsville streetscape project set for second phase, Aaron Richardson, Daily Progress, World Media Enterprises, retrieved January 24, 2019.